Summary: Good luck, rich whisky, I compared to directly with Bowmore Black Rock and this 18 yo was clearly better. Fresh sweetness paired with the typical Bowmore smoke. In the finish then licorice, clove and some lavender. Not the typical sherry grenade like the 15's Darkest and Laimrig. A very beautiful, mild and independent Bowmore. Never got the Bowmore-bashing to be honest. This is a very enjoyable dram (devoid of lavender?) and full of complexity. Thumbs up! Deep and rich! Petroleum, wet paint, modeling clay, forest soil, and burned sugar. Gorgeous – and indeed a complex nose! Morphs into rasp berries, cake dough, and tarry oranges. Velvety arrival. With honey dew and forest berries aplenty. Associations of naphthalene (moth balls) and tar – receding quickly however. Mild bonfire smoke and cured meats. For 18 years this is remarkably un-oaked. Medium. At last some tannins, with caramel and coffee. 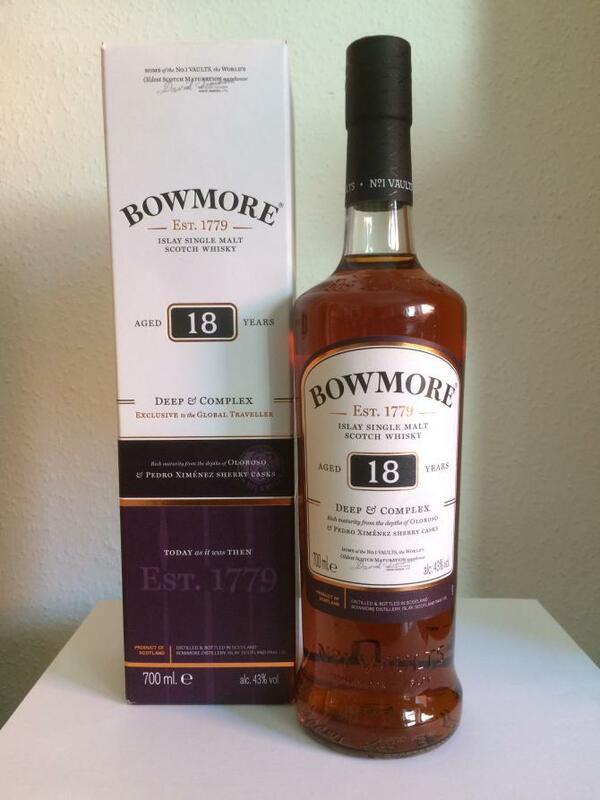 A very nice sherry nose with slight fruity and seaside Bowmore touch plus some raisins, orange peel and chocolate. The taste is overly „uber“ sweet, it feels like biting into a praline made with too much sugar and almost no cocoa. Feels like the whisky has drowned in PX sweetness. not at all pleasant for me. The body is weak @ 43%, which rather feels like 30-35%. 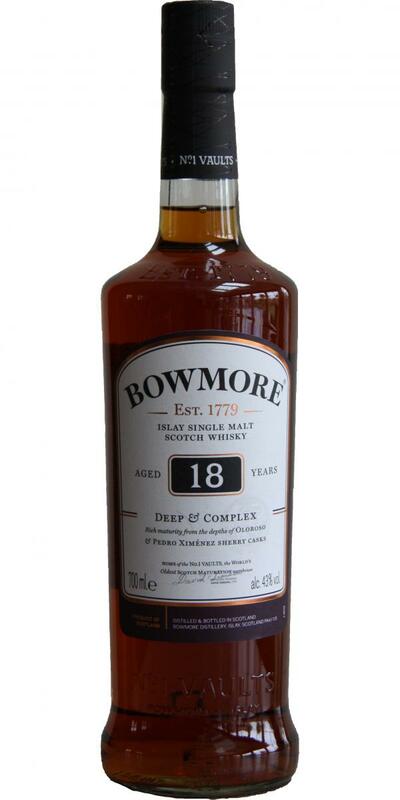 Despite this, it stays on the palate for a surprising long time, which is great news when the smothering sweetness disappears.Bowmore characteristics are coming through at this time, unfortunately to be smothered again by too much sweetness after a while, which makes me want to drink some water to make it go away. The very nice nose is a treat, however it’s not my preferred style to drink, but can see many that will love it’s prominent PX sweetness. starts with intense sherry! nuts, dark fruits, moldy wine cellar. a hint of orange as well. fine peat, a little salty. nice but it lacks a bit of complexity - for example compared to the Laimrig. nice sherried peated dram! Price is very reasonable.